Paul Tawczynski is the Captain and head guide of his company, Charter The Berkshires since 2004. He spends about 200 days on the water annually, and usually about 100 of those are on the ice, guiding anglers from Novice to expert on the lakes of Berkshire County, MA. 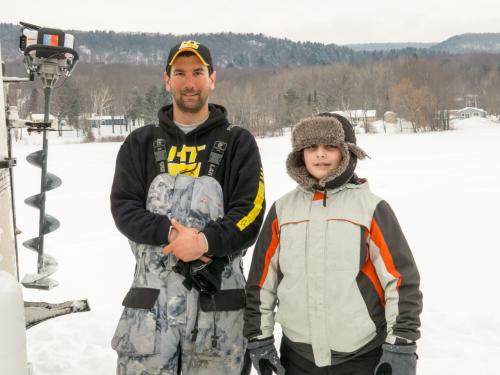 He specializes in teaching novice ice-anglers how to ice fish, making the sport accessible to anyone who wants to try. Each year he and his crew of guides take in excess of 3000 people per season onto the ice, many for their first time. He has a background as a Professional Tournament Angler, reaching as far as the B.A.S.S Club World Championship in 2007 where he was captain of Team Massachusetts. Paul Pro-Staffs for HT Enterprises, as well as Vexilar, Deep Freeze, Jaw Jackers, PK Lures, SnoBear and more. Paul personally holds over five dozen Massachusetts State Bronze Pins for Qualifying fish as well as two Gold Pin Qualifying fish, but his greater achievement is for his customers who since 2004 have caught just over 300 Bronze Pin Qualifying fish and 5 Gold Pin Qualifying fish. One customer ever broke an Ice Fishing World Record!
" Paul is the host of the upcoming TV show "Guiding Ice" with Paul Tawczynski. A groundbreaking show that will feature everyday anglers from all demographics learning how to ice fish using today's modern approaches and equipment. Host of TV's Guiding Ice.